The Arkansas Department of Environmental Quality and Arkansas Geographic Information Office in partnership with the U.S. Geological Survey are coordinating the Arkansas National Hydrography Dataset (NHD) Stewardship Program for the maintenance and stewardship of the high resolution NHD in Arkansas. This activity is guided by the NHD Memorandum of Understanding between the Arkansas Department of Environmental Quality and the U.S. Geological Survey. This agreement was signed in October of 2008. 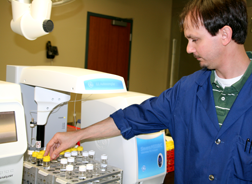 Each year thousands of samples—soil, water, fish, hazardous substances and more—are analyzed in ADEQ’s state-of-the art laboratory. The resulting data is invaluable to Arkansans who want to learn more about the mercury levels of fish in their favorite fishing holes or about the air quality in a given town. The Air Chemistry lab operates a statewide monitoring network, including necessary repair, maintenance and quality control activities. The monitoring network provides the data to measure attainment status of both state and national ambient air quality standards. Pollutants including lead, ozone, particulates (PM10 and PM2.5 or PM fine), and oxides of nitrogen, carbon monoxide, and sulfur dioxide are monitored at specific sites around the state. The values are used by the ADEQ’s Air Division to determine if air quality is within the guidelines set by EPA. Data collected is entered into EPA’s national database. 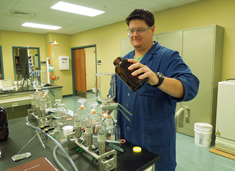 Employees in the Laboratory and Monitoring Services' environmental laboratory also analyze samples from wastewater plants to ensure compliance and from ground water for aquifer protection. They analyze ambient water quality data collected from hundreds of monitoring stations around the state. Whether you are a citizen wanting to know the quality of the lake, river or stream near you or an environmental consultant needing information to prepare a permit application for a client, you can download water quality data. 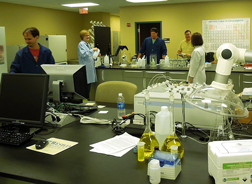 The division also certifies laboratories in Arkansas and across the US, ensuring that data submitted for development, planning, permitting or other functions in our state meet strict standards.